"ALAN RICKMAN'S BRACINGLY INTELLIGENT REVIVAL"
Directed by Alan Rickman, this fiercely modern battle of the sexes comes to BAM following a sold-out run at London's Donmar Warehouse (RED, Jude Law's Hamlet, Frost/Nixon). 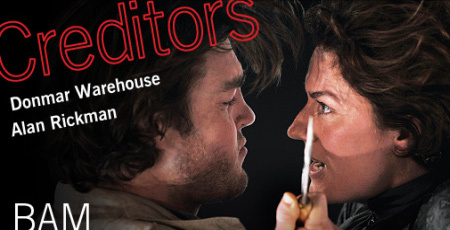 A darkly comic tale of vengeance, jealousy, and psychological warfare, Creditors unfolds as a young husband (Tom Burke, in his New York debut), anxiously awaiting the return of his new wife (Olivier Award-nominee Anna Chancellor), falls under the sway of a mysterious stranger (Tony Award-winner Owen Teale). *Offer valid for performances on April 16, 17, 21, and 22 only. May not be combined with other offers and not valid for prior purchases. Subject to handling and facility fees and availability. Maximum of 4 discounted tickets per household. Offer good through April 20, 2010.